Are there supplements on prices set? No, prices listed on our website are final prices and no additional cost. How do I have to pay for transfers? Perform your payment to our driver on the day of your arrival, you can make your payment in cash or by Visa / MasterCard. Is it safe to pay via Internet? Absolutely. Our payment server is supported by a prestigious financial institution, which guarantees complete security of your payments over the Internet. Will I receive any proof of my reservation? Yes, we will send you an email with your booking details and a password to our system, allowing you to make changes or cancellations. It is important that you keep this email and bring this form on arrival at the airport. Do not worry. Our staff at the airport and checked our booking arrival times of flights. There are no charges pending the flight delay. Where will I find the driver at the airport in Palma? In the Meeting Point in the arrival lounge of the airport of Palma de Mallorca. 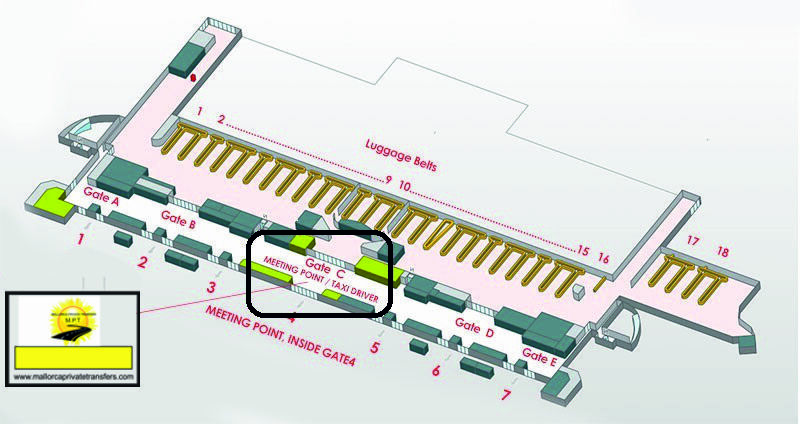 Gate C.
What do I have to do if I can not find the driver? What I have to do if your luggage is lost? Do we have to walk far to get to our car? No, for transport vehicles are parked in the parking lot exclusively for carriers next to the arrivals lounge. What are the vehicles used? Reliable? How I can organize my move back? What if I have the details of my return before I travel? If I have booked the shuttle goes out, I have to confirm? Cheaper, maybe. Worse, too. Best at all. We guarantee a quality service, as we use without sparing the best physical and human assets. The choice is yours. If I cancel my transfer I get back the money? If you cancel the transfer within 48 hours of arrival , we refound you 100% of payment. • If you cancel the transfer within 48 hours and 24 hours before arrival, we refound you 50% of payment. • If you cancel the shipment after 24 HOURS prior to arrival , we refound you 0% of payment. We operate a large fleet of vehicles capable of carrying up to 19 passengers and luggage. All vehicles are air conditioned and have satellite navigation equipment onboard. We offer a choice of vehicle types to suit your requirements and all our drivers are required to meet our exacting service standards. Our prices are competitive and offer worthwhile savings when compared with the cost of airport taxis. We have a transparent and fair pricing policy with our lowest prices only available online. Our prices are fully inclusive of car parking charges, and we do not make charges for waiting whilst you exit customs and immigration. Consequently some of our prices may be a little higher than our competitors however you can be assured that the price your are quoted for your journey is the price that you will pay.